Halloween is just around the corner, which means costumes, candy and all manner of spooky and kooky holiday decor. But if you're more into stylish dinner parties than ghoulish haunted house vibes, we're with you. You can still get into the spirit of the season (pun intended) without compromising on your taste. We found 13 chic-meets-playful Halloween decorations and entertaining items that will make your home look totally boo-tiful—in all the right ways. 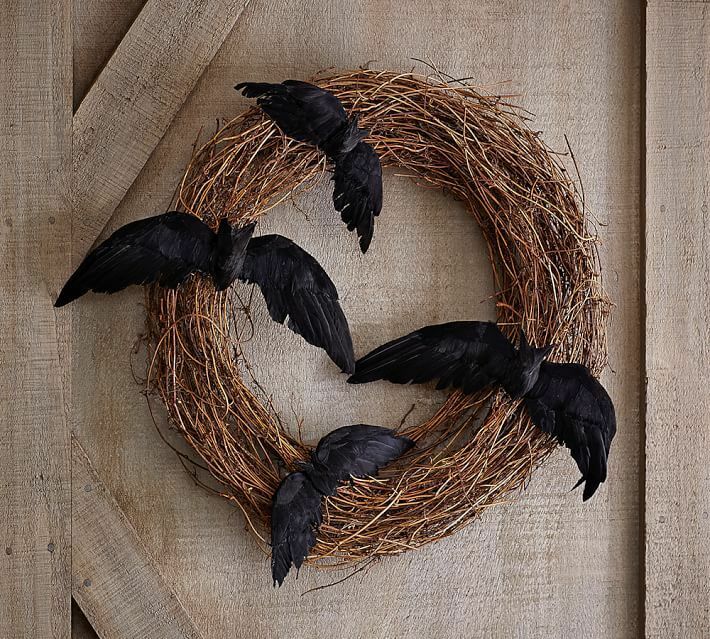 If you had to come up with one single piece of decoration that was both low key and festive—this natural wreath with bats made from feathers would be it. We love how festive and seasonal it is, while also being neutral and tasteful. Set the mood for a candy hunt in the backyard by twilight or trade in your usual porch lights for these glowing purple bulbs. Or, to really get your house in the Halloween spirit, hang them in the kids' bedroom or playroom. Dress your dinner table around Halloween time with these metallic painted faux pumpkins. Intersperse them with tea lights and short little bouquets for a seasonal and stylish meal setting. Part kitsch, part cool, we're a little obsessed with these zombie lawn flamingos. Perfect for leading the way for trick-or-treaters... Or setting the scene for the adult cocktail party afterwards! Subtle, neutral and fun—these fake pumpkins from Nordstrom are a sweet little Halloween treat you can display just about anywhere. If it were up to us, we'd use them to add a festive element to the guest bathroom counter or entry console. If the idea of rotting pumpkins on the porch makes you a little icked-out, we hear you. 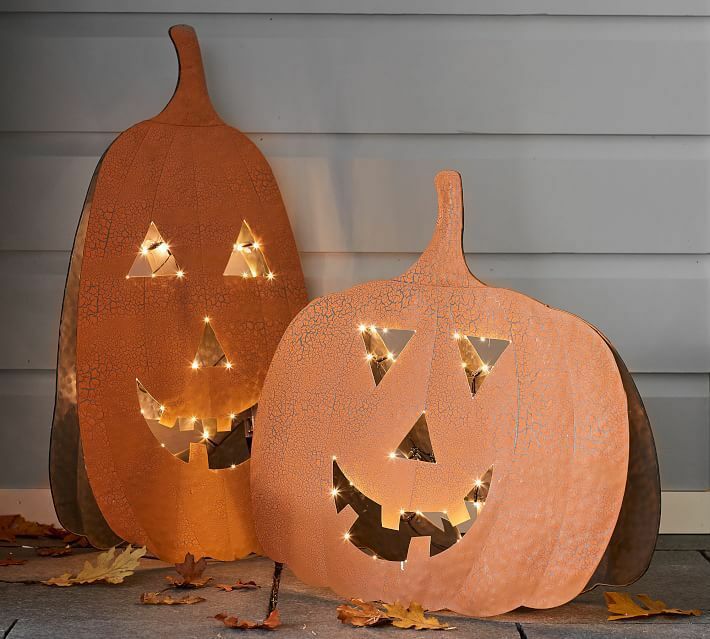 Get the glow of a jack-o-lantern with these galvanized LED pumpkins from Pottery Barn that don't require carving or candles. On their own these candles are just a bit of color, but mixed with more fall accents in your home, they become an easy way to infuse your spaces with a bit of hardly-there Halloween spirit. Keep the graveyard vibes going even in the powder room—these black-on-black hand towels have a chic skull pattern that will amuse guests without compromising your aesthetics. For all the witchy women out there, give your kitchen a little dose of Halloween magic with these playful dish towels you won't mind wiping your candy hands on! This lace spider web table cloth might be the boldest Halloween decoration piece on our list, but we love it! It's part fashion, part costume, and perfect for setting the table for a festive dinner or all ages holiday buffet. Layer it over a red or purple tablecloth to make more of a statement.